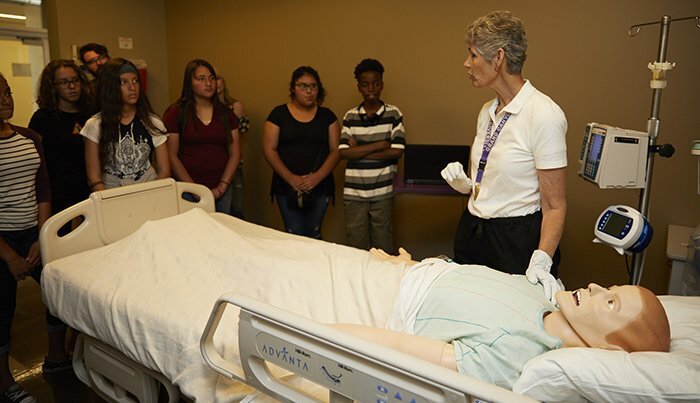 Dolores Hagmeier, simulation lab coordinator for GCU’s College of Nursing and Health Care Professions, shows students from Osborn Middle School all the things SimMan can do. After Phoenix seventh-grader Wendy Chitay felt SimMan’s pulse race and learned how to hook up the high-tech patient to oxygen, she reaffirmed her decision to study medicine. 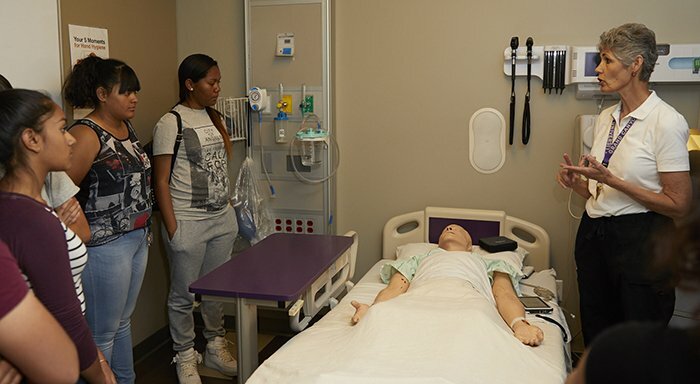 “He seems so real, and working with him gets me excited about being a surgeon,” said Chitay, one of 11 students from Osborn Middle School who on Tuesday toured Grand Canyon University’s nursing simulation lab as part of a summer career camp. The object of her admiration is a $70,000 mannequin that blinks, moans, vomits, cries, breathes and experiences cardiac arrest. Hagmeier used a black light to detect any remaining bacteria after students washed their hands. The experiment showed them the importance of clinical hygiene. The Osborn students watched intently as Hagmeier and Kim Williams, an adjunct nursing instructor, demonstrated how they teach nursing students to check the $70,000 mannequin’s blood pressure, heart rate and oxygen level. SimMan is hooked up to real-life monitors as he rests in a replica of a hospital room. For Osborn teacher Rex Johnson, the tour gives students a realistic introduction to GCU’s nursing program. “It really gives them a good idea about what it’s like to study to be a nurse and to become a nurse,” said Johnson, an eighth-grade language arts teacher. The early introduction also allows the junior high school students the opportunity to take a full load of science classes in high school to better prepare for a career in health care. Shaelyn Baker, a sophomore nursing student from Peoria, said GCU students are just as impressed as touring junior high students by the state-of-the-art simulation lab. “We get to learn real-life skills without having to practice on a real person,” said Baker, who assisted in the tour. Although SimMan is the most complex mannequin, the lab includes other lower-tech versions, including babies and children. All are used to teach students the hows and whys of nursing care. “We never call them dummies. They all have names, and to us they are real patients,” Hagmeier said. Contact Karen Fernau at (602) 639-8344 or karen.fernau@gcu.edu.